My colleagues and I have just published a paper on the genetic diversity and population history of contemporary Iñupiat peoples (the indigenous inhabitants of the North Slope of Alaska) in the American Journal of Physical Anthropology. It’s open-access for at least a few months, so you can read it in its entirety here, our collaborator Dr. Anne Jensen ‘s thoughts on it here, and Archaeology Magazine’s article on the paper here. I’ve also summarized our findings below. 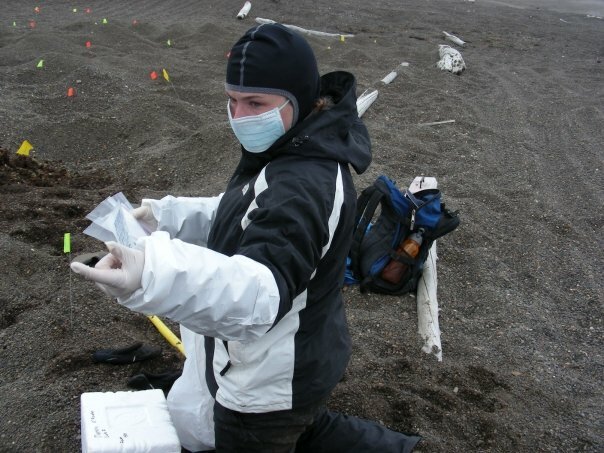 Me, working at the Nuvuk site in 2009. Archaeological research has shown us that humans have been living in the North American Arctic for about 5,000 years, and that during this time there have been two major cultures. The Paleo-Eskimos, the most ancient inhabitants of the Arctic, occupied the northern Arctic coast from Alaska to Greenland for about 3,000 years. The Neo-Eskimo Thule first appeared in Alaska around 750-800 years ago, and spread along the coast as far as Greenland in just a few generations. 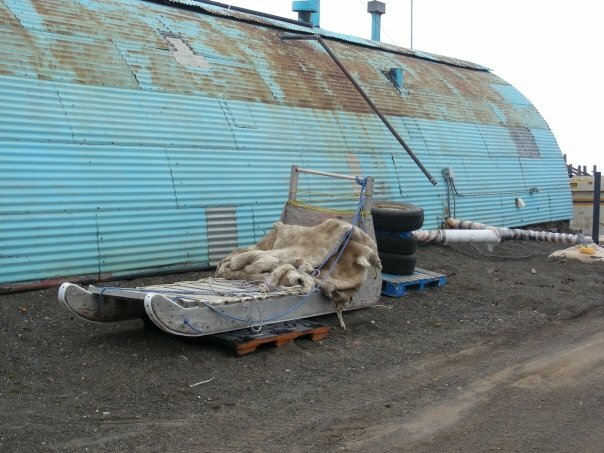 The Thule introduced many of the same technologies (dogsleds, snow houses, umiaqs) and lifeways (bowhead whale hunting) that we see used by Inuit and Iñupiat peoples living in these regions today, and so the Thule have long been considered their direct ancestors. But where did the Thule come from? Were they related to the Paleo-Eskimos, or were those two groups biologically distinct from one another? And how are different groups living in the Arctic today related? What are their shared and individual histories and prehistories? These are the questions that our research team has been working on for several years, in partnership with Iñupiat peoples. Although genetic research has been done to characterize the Eskimo and Inuit of Greenland and Canada, and the Aleuts, nothing is known about the genetic diversity of the Iñupiat. Archaeological and genetic work in the Arctic has led us to believe that all Eskimo, Inuit and Iñupiat peoples are closely related, and that both the Paleo-Eskimo and Neo-Eskimo migrations began in the North Slope. Barrow, AK. Photo by Jennifer Raff. We are trying to answer these questions by genetically characterizing peoples of the North Slope in Alaska. We are doing this in close collaboration with a research team from the University of Utah, who are helping locate and rescue burials at the Nuvuk site, in danger of being destroyed by coastal erosion. The peoples of Barrow agreed that genetic testing of the Nuvuk ancestors would be of interest to their community. While this project was being planned with the Elders in Barrow, they also suggested that we might also collect genetic information from communities across the North Slope, because it would help us understand how modern communities are related to each other, and to their ancestors. We agreed and designed the project with permission from the Ukpeagvik Iñupiat Corporation, the Native Village of Barrow, and the Senior Advisory Council of Barrow (Elders). 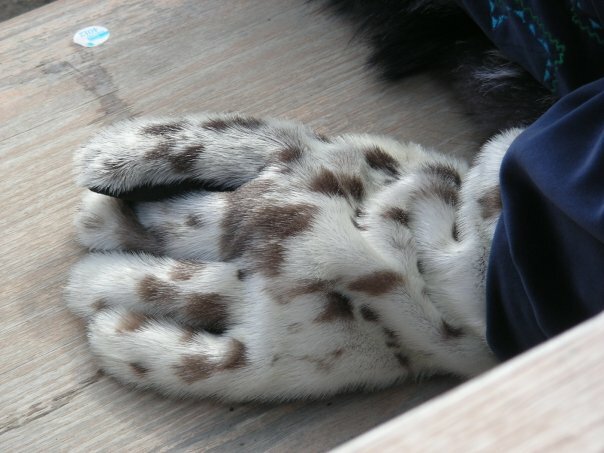 The project was funded by the National Science Foundation Office of Polar Programs. 181 adults from the communities of Atqasuk, Anaktuvuk Pass, Barrow, Kaktovik, Nuiqsut, Point Hope, Point Lay, and Wainwright agreed to participate in this study, and generously donated saliva samples to our research team. They also provided us with genealogical information about where their parents and grandparents were born, so that we could better understand the histories of each family that participated. This research has been done in a number of stages to address different questions, and we have returned to these communities several times over the last few years to share our results with the communities and to learn what they think about our findings. We are able to incorporate important community feedback and knowledge into our final research reports, the first of which was recently published in the American Journal of Physical Anthropology. Thus, our research is the result of an ongoing partnership between researchers and community members. We hope that community members will share with us their further interpretations, comments and questions. What maternal lineages are present in the North Slope? How do they compare with other groups in the Arctic? Can we see any evidence to support the idea that the North Slope was the staging ground for the Paleo- and Neo-Eskimo Thule migrations further eastward towards Greenland? Do we see any evidence that the Paleo-Eskimos might have left some genetic lineages in the North Slope, or was there a complete population replacement of the Paleo-Eskimo by the Thule in this region (as appears to be the case elsewhere in the Arctic)? How do individual communities within the North Slope relate to one another? Do we see evidence for the movement of women between these communities, or do they appear to be genetically isolated from one another? We found all Arctic-specific haplotypes (groups of closely related maternal lineages) present in the North Slope communities. These haplotypes are known as A2a, A2b, D4b1a. The ages and patterned distribution of these haplotypes within the North Slope, compared to Canada and Greenland, fits with the archaeological model that the Peopling of the Arctic began in the North Slope. Surprisingly, we found evidence that we think suggests there may have been some migrations of Greenlandic Inuit back to the North Slope. We would like to explore this question further in the future with additional genetic markers. We also unexpectedly found two haplotypes that have never before been seen in contemporary Arctic populations. C4 is a haplotype that is seen in Native Americans. Its geographic distribution suggests that it might have been one of the haplotypes carried by the earliest peoples to enter the Americas. We don’t know yet why we see it in the North Slope (which was peopled by a separate ancestral group than the rest of the Americas). Perhaps it is because of recent marriages between Native American and Iñupiat families. Or perhaps it is a remnant of a much more ancient contact between these groups. The second surprising haplotype—D2—has only been found in this region in ancient Paleo-Eskimos, never in contemporary Eskimo or Inuit groups from Canada or Greenland. Does its presence in villages on the North Slope mean that the Paleo-Eskimos were also ancestors of the North Slope Iñupiat? We think so, and we will be further exploring these questions in the future with additional genetic markers. In looking at individual maternal lineages, and comparing their geographic distributions, we were able to learn more about the relationships and histories of North Slope communities. We found that there were many lineages shared between villages along the coast, suggesting that women traveled frequently between these communities. In fact, when we compared the genetic composition of all the communities in the North Slope, we found that they were all so closely related that they could be considered one single population. This fits well with what the Elders have told us in their stories and traditions about Iñupiat history. Barrow AK. Photo by Jennifer Raff. Thus, we have learned a great deal about Iñupiat history from these results. But they only reflect the population history and movement of women. We are currently writing a paper on our results looking at genetic markers on the Y chromosomes from men in the North Slope. In this paper we will be able to discuss the population history of men, as well as how contact with outsiders in the 19th century affected the Iñupiat peoples. We will write a summary of this paper as soon as it is finished, and in the meantime, we invite people to share their stories and thoughts on this research. I grew up in Barrow, and as a student there I got to spend 3 years working as an archaeologist’s assistant – was very cool and interesting stuff. I loved the time I spent in Barrow, but I was only there in the summers. I can’t imagine what it’s like in the winter! You already stated that this study was done with permission and cooperation from the locals, but could you describe briefly what sort of thought and concerns go into such a partnership? Are there potential downsides for which you need to prepare them? I’m thinking of things like information that could alter their worldview, political alliances, treaties and borders. I spent a year in Barrow and I loved it. The Inupiat people I encountered seemed to embrace science AND traditional knowledge in a way that we could all learn from. I look forward to reading the entire paper. Thanks!! I love the town and the people who live and work there. I hope I get to go back soon!